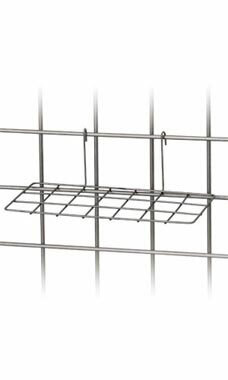 Show off your merchandise on our wire grid shelves. These shelves easily attach to wire grid panels for a quick assembly and sturdy display that will keep your customers interested and happy! The 10” by 4” surface works perfect for arranging single shoe presentations, or almost any smaller item that will fit on this rack. The sleek steel- colored finish looks best with the rest of our raw steel collection, but will still fit in any environment you want it to!